Setting fire to Wales, it is, one embankment at a time #steam #railway #llangollen – The Diesel-Electric Elephant Company. One of the rewards at the end of the Llangollen Canal, if rewards there need be, is the Llangollen Steam Railway. Trains that run on boiled water! Well, if truth be told they run on tracks, but it’s the over-excited H2uh-oh that moves them along. Tap water usually, not Perrier. Perrier gives the engine the burps. So there’s lovely for you, and it is. For about £13 a ticket a chap gets to ride the chuff-chuff some ten miles out and then some ten miles back to Llangollen – and all in a nice First Class compartment in a carriage with a proper, old-fashioned corridor. For comparison purposes, the initial commercial railway on this line opened in 1862 and £13 then would have bought you Argentina with enough change left over for an ice-cream. 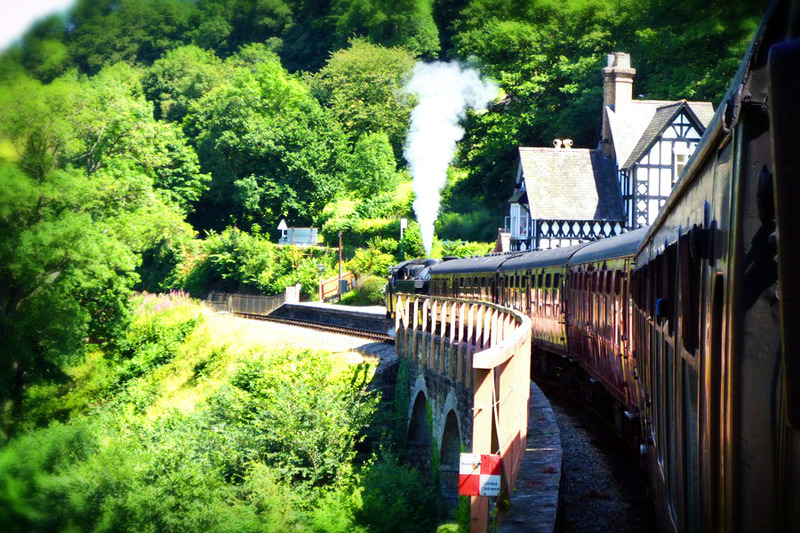 The Llangollen Railway website is here. History has given us many, many fine locomotives: the 4:50 from Paddington; the Titfield Thunderbolt; the 3:10 to Yuma; von Ryan’s Express; the Empress of India; both shunting engines at Bhowani Junction; even the Midnight Train to Georgia. The world’s fastest steam locomotive ever is the Mallard, proving for once and for all that Jenny Agutter was one hell of a train driver even when not in front of the film cameras. The record, you say? Oh, that’s 126mph. This wee locomotive is a little bit slower than that, but still very businesslike and impressive – if you are a fan of bloke stuff (and I am). After the apocalypse it will be in my collection. Lots of whiskery volunteer chaps run the railway now, doing things with oil cans and wheel tappers and shunter’s wotnots. The station itself is very nicely laid out with faux-luggage and gentlemen and ladies looking into one another’s eyes and waving white handkerchiefs as they each consider marital infidelity. I have never been a fan of infidelity, much preferring Grundig or Pioneer – a more mellow sound, I find, when listening to the Light Programme. Our trusty puffer with the catchy name of “80072”, all steamed up with somewhere, just for a change, to go. I told the driver that he should give me two minutes to take my seat and then he should proceed. The story of the engine may be found on this website. Boiled water, it’s all done with boiled water. The ten miles of track in use follows the River Dee, and all of it, rather like my underwear, an area designated as A Site of Special Scientific Interest. This just means that Her Maj’s government has an iron fist controlling everything that goes on in there. It’s very scenic though, for all the science involved. It’s the scenic, do you see? Wales is a bit green and pleasant too. We set fire to a lot of it on the way out. On the return journey we were initially puzzled by there being more smoke than would seem necessary from 80072, sparks flying and the crackle and heat of a fire rather close by the windows of our compartment. The train indeed squealed to a halt. By dint of some rather clever “the poking of our heads out of the windows against all regulations” we discovered that the train had stopped so that the chaps on the engine could spray water on the embankment. I suppose that sparks from my incendiary wit had, at some stage, blown out of the window and set light to the dry grasses. There was also a chap with one of those politician-thrasher thingies, a flap of un-firelighter on a stick, but he didn’t use it. Snap, crackle and pop goes the embankment. Oops. Daddy, I know why my friend Little Hawk is called “Little Hawk”, but why am I called “Put Your Thumb Over The End; You’ll Get A Better Spray”? The train carriages were a revelation in themselves – the seats, for one thing, while a little arthritic in the old springs line, were wide enough for a human being to sit in comfortably! Richard Branston with your Virgin nonsenses please take note. There was – brace yourselves – leg room sufficient unto a six-foot tall chap like me (just). Luggage racks and everything. A real, live ticket-inspector came around and inspected our tickets. I don’t know what he expected to find on them, but I hope that he found what he was looking for somewhere on the train. All gone now, save for these “heritage lines”, and the younger generations will never know such innocent (and inexpensive) pleasures. Can I bring myself to recommend a visit and a trip? Oh yes indeed. It was a very gentle pootle, with lots of clanking and some whistling (on the part of the engine, one presumes) – and Llangollen itself has some very fine eateries and alternative places of visitation. I may come back next year, just to check that Dr Beeching hasn’t had the line electrified or shut down again or something. I’ll leave you with a view of the station at Llangollen and one h.a.p.p.y. thought. …and here’s the h.a.p.p.y. thought. There’s not one thing on this notice indicating a requirement for the removal of screaming brats, toddlers and rug-rat spawn from the push-chairs and buggies before their stowage in the Guard’s Van. Nothing requiring their collection again after the trip, either. Dump ’em in there folks! Chin-chin, folks, for the moment. Thanks for the entertaining train journey Ian… you should really take over from Portillo.. Having lived and worked in Mid and North Wales I am astonished at your ability to find so much sunshine… very enjoyable thank you. Thanks for the wonderful ride on this marvelous old train. Though I truly am fascinated by all trains, there is nothing quite like a steam engine. Court Jester, sir? I shall have you ordained Poet Laureate, given ermine robes and an electric typewriter. I should be moving today, really, but it seems to be too windy – far too windy for my liking. Mayhap I shall have to postpone, but then that throws me into the busy days of the weekend. Decisions, decisions, decisions! It is a different experience riding in a compartment rather than a long, long carriage – somehow more intimate, more personal and less “cattle class”! I could quite see how Miss Marple could get engrossed in a book and feel private enough to have a snooze. The bonus here of course is the steam-wafted scenery floating past too. A really fun day out. It sounds delicious! Of course I should include both Miss Marple and my lovely Welsh granny, both gone… but no doubt would accompany me in spirit. That is when I get myself finally to Wales! If they use up all their water to put out fires, they aren’t going to able to go home. I would want a stricter accounting of water before I rode again. Someone needs to get an auditor in. I did wonder about the water, and if they factor in an amount for fire-fighting during the summer season! It added such a personal, almost liesurely touch to the journey – I can’t imagine a modern express taking the time to worry about anything at the side of the tracks. I wouldn’t have been too surprised had we stopped again a couple of times and calls gone out for colunteers to help move sheep and cattle off the tracks. Like all of these restored lines it’s a great experience. There’s nothing better than a big, steam engine train. So many memories of those trains in West Virginia and Pennsylvania. This is marvelous! Another superb piece and jump started my nostalgia. I could almost smell the heady aroma of the steam train (sigh!) why do really good things have to be given over to new fangled monstrosities, the pace of life in those days was wonderful; now we are made to go faster to get there quicker and for what? Your film making gets betterer and betterer Mr Baldy Git! Excellent shot though! It is, indeed, a lovely place and a beautiful train. We rode it last year but didn’t have the excitement of bush fires! We did get a lot of ashes from the engine in our tea though. I shall ask to go back and do it again. The Llangollen Railway has asked me to advise you that “ashes in your tea” is extra, and please to be kind enough to forward 8/- 6d to the caterers with not some little haste, a thruppenny stamp and oblige. My downfall with this visit was to realise that they also do ENGINE-DRIVING DAYS! Hugely expensive, but oh boy – what a day that would be! I hope you are to put all these blogs in a book. I would buy it. A great story and funny with it – brilliant. Still laughing.